Order your EMG KFK Active Kerry King Electric Guitar Pickup Set from AMS and enjoy 0% Interest Payment Plans, Free Shipping, Free Extended Warranty & 45 Day Money Back Guarantee. 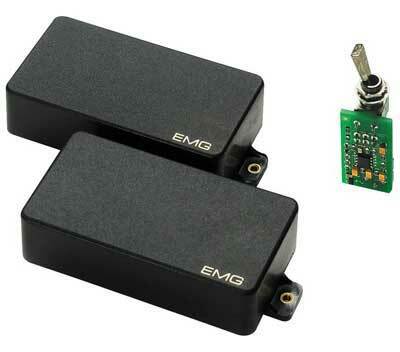 The EMG KFK Pickup Set lets you discover for yourself the amazing tone that Kerry King gets on stage and in the studio. EMG introduces the EMG-KFK Kerry King (Slayer) signature model. The combination of the EMG-81 and EMG-85 along with the PA2 (20db gain booster) delivers maximum distortion for Kerry and Slayer's bone crushing tones. This is his exact configuration used for live and studio action. Also a removable Kerry King card on the box and 1 EMG / Kerry King signature collectable guitar pick.